The Konica Minolta Bizhub 601 is a standard copier and scanner. By adding the fax and printing functions, the bizhub 601 becomes the perfect multifunctional solution for high-volume offices. Projects are delivered quickly at speeds up to 60 pages-per-minute. The 300,000 page monthly duty cycle will keep up with the demands of busy offices. The bizhub 601 black toner (TN-710) cartridge will yield an astounding estimated 55,000 sheets at 6 percent coverage. Precision premium compatible toners will reduce costs on consumables. Both the Precision premium compatible and genuine Konica Minolta brand toner can be replaced without interrupting projects. The versatile paper handling on the Bizhub 601 stems from a four drawer configuration. Each drawer has the capability to accommodate separate paper sizes up to 11″ x 17″. The bypass tray can process envelopes, labels and all paper sizes. The bizhub 601 paper capacity can be maxed out to 7,600-sheets, which will minimize paper reloading. 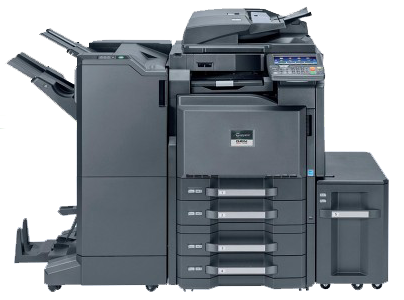 With the Bizhub 601, Konica Minolta presents two high-speed multifunctional that perfectly fulfill the needs of CRDs and high-volume office locations: top productivity, high flexibility and absolute reliability. Both devices take advantage of Konica Minolta’s state-of-the-art technology as the basis for their comprehensive and versatile reproduction capabilities. extensive print and copy volumes. Their impressive media handling capabilities and versatile finishing choices make both ideal to enhance existing production facilities in corporate office environments and central in-house print rooms. a single device, feature latest technology and advanced software applications, provide above- their-class quality and are entirely eco friendly in their performance.